Pork chawwwwps and apple sauuuuu-I MEAN roasted grapes. Lately I’ve been all about meals that basically make themselves. Meals that take less than .233462 minutes to pull together. Meals that use less than .19827345 ingredients from beginning to end. Meals that wash my car and mow the lawn. Meals that give me facials and paint my fingernails. Meals that press “play” on my remote control so that I can watch yet another episode of Law & Order. Meals that sing to me, rub my shoulders and braid my hair. Meals that back up my computer, make the beds and take out the trash. Meals that play ping pong with me, brew my morning tea, and tuck me in at night. Meals that do the laundry, fertilize the yards and grab the mail. Meals that- I’m just kidding! I just wanted to see how long I could drag this out before you lowered yourself into a shark tank. 1) This meal does all (or 2%) of the above. Yay. 2) It didn’t snow! However, it rained all day and now my lawn is 45 feet tall and beggeth for a moweth. Looks like I’ll have to make this pork chop take on that task, right? Haaaaah! Oh. By the way, have you ever roasted grapes? No? Should you change that? Ya-hes. So, when I planned this meal, I accidentally bought seeded grapes, and my husband started snacking on the grapes and I was all, “Don’t eat all of those! I have plans for them.” And I rubbed my hands together like an evil commander, ya know. And he goes, “These grapes have seeds in them.” And I replied, “WHAT. Are you serious? Please tell me you’re joking because I’m roasting those and I don’t want to feel like I’m chomping on broken fossils.” And he said, “No, they really have seeds in them.” So, I had to go back to the store and get seedless and he juiced the ones with seeds in them. The end. It’s a brand new world ahead of us, you guys. Also, if you sear up some simple pork chops with a little salt and pepper while roasting a few handfuls of red grapes with a drizzle of olive oil and some fresh thyme, your Lou is pretty much going to forget how to skip. And don’t try to ask a grape to braid your hair. It gets awkward FAST. Preheat oven to 400. Arrange the grapes on a rimmed baking sheet. Drizzle with a Tbs. or two of oil. 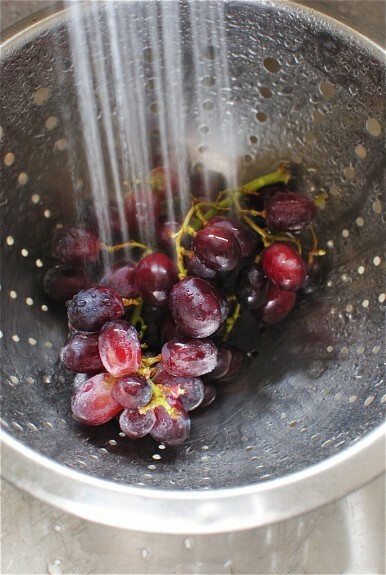 Sprinkle thyme sprigs over the grapes, along with a small pinch of salt. 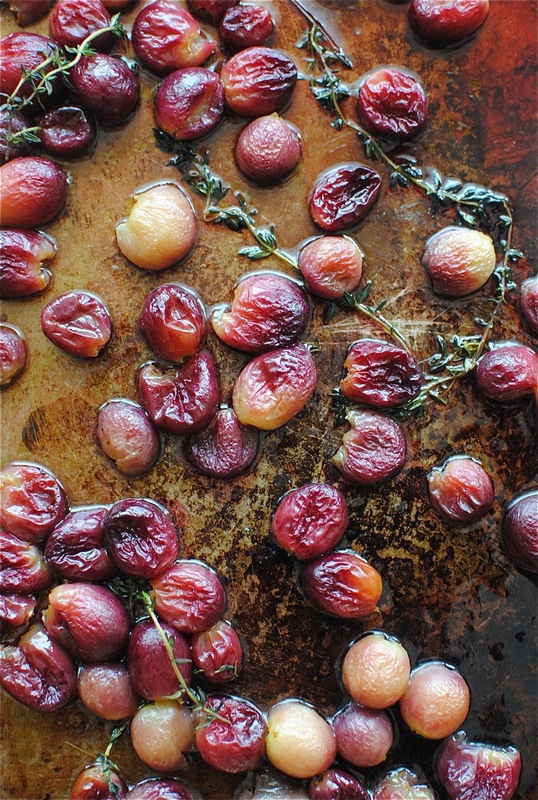 Roast the grapes for 20 minutes, or until they’re slightly wilted and bursting. In the meantime, heat the remaining oil in a cast iron (or regular non-stick) skillet over medium-high. 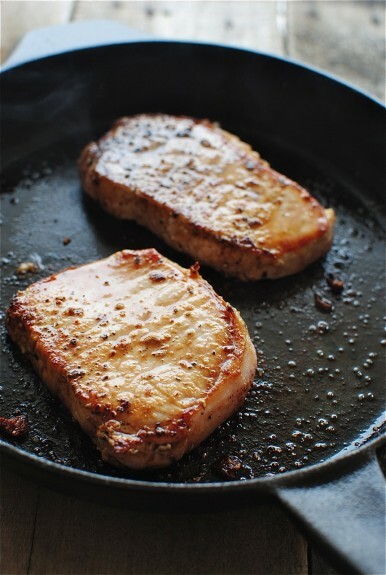 Season the pork on both sides with salt and pepper and sear for 4-5 minutes per side. They’re pretty thin, so they won’t need too long. 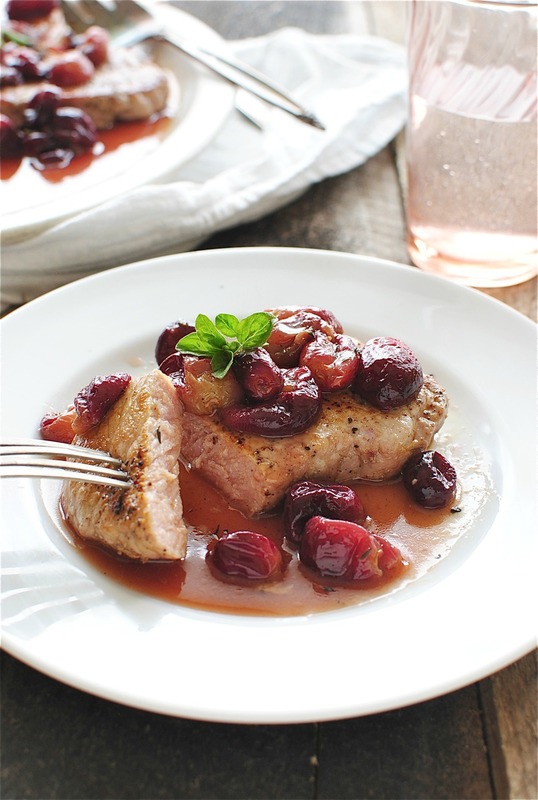 Arrange the pork on a serving plate; sprinkle the roasted grapes over the pork and drizzle with any remaining grape juice. Hahaha, grape juice! Roasted grape juice. Never mind. Garnish with fresh oregano and serve with crusty bread and a nice green salad! I can assure you, that meat is tinged pink from the grape sauce! I’m not trying to kill you. Or am I . . .
Drooling right now. Amazing flavors, Bev! The grapes wouldn't braid my hair either. Boo ; ) Now I'm gonna need a fork stat. 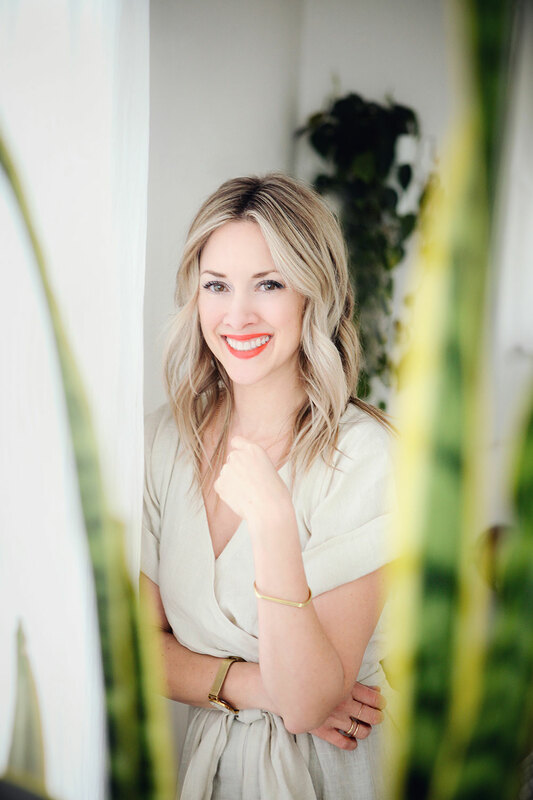 Love the flavors Bev and your story pretty much just made me smile the whole way through! This dish looks so easy and is just so lovely. Perfect for a stay-in date night! So yes, I am all about the easy meal that changes diapers for me. Also. When my husband and I went to New York for vacation, we had brunch at Norma's, which is a tad fancier than what we are used to...his omlette was served with what looked like cooked grapes. He refused to eat them because cooked grapes skeeve him out, so I took a bite, and it turned out they were tiny potatoes. Also, when you are expecting a grape and it turns out to be a potato, it doesn't taste very good. But when you KNOW it's a potato, it tastes great!! I roast grapes and add them to pizzas with Italian sausage. Yummo! Oh lordy this looks sooo good! I HATE seeded grapes too and they are such a hassle. 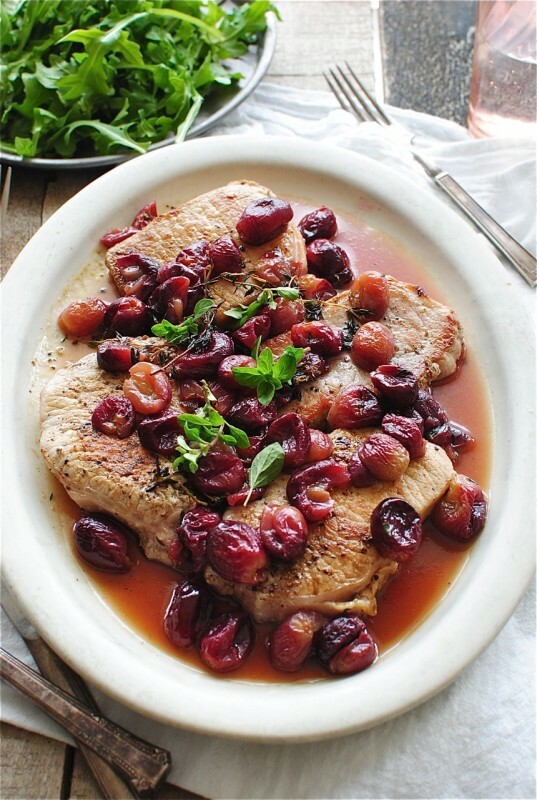 Grapes in savory dishes is the BEST way to add a touch of sweetness! Love, love, love this, Bev! Its so freaking gorgeous Bev. I would let anyone braid my hair. Even a grape. Ready for sad news? We don't eat red meat (I realize that if you are a cow this is not, in fact, sad news... but I know you're not a cow.) . I'm going to try this with salmon. Don't try to talk me out of it! I didn't think pork was considered red meat. Am I wrong in this thought? Uh oh, did I say somewhere that it was?! I have never even seen a roasted grape! It sounds like I need to fix this fast. Also, I love, love good dinners that take few ingredients and not a lot of time, can't wait to try this! This looks wonderful. I bet the roasted grapes give it such a unique and awesome taste! Roasted grapes?!!! This sounds incredible! Roasted grapes. I need to get on that. This is just gorgeous. Seriously. Good grief Bev, this is one gorgeous dish. Those roasted grapes! Pretty pretty. What a brilliant combination and so suitable for a big dinner party or special solo dinner. Would i be able to use chicken thighs in place of the pork? or would the flavours not work? 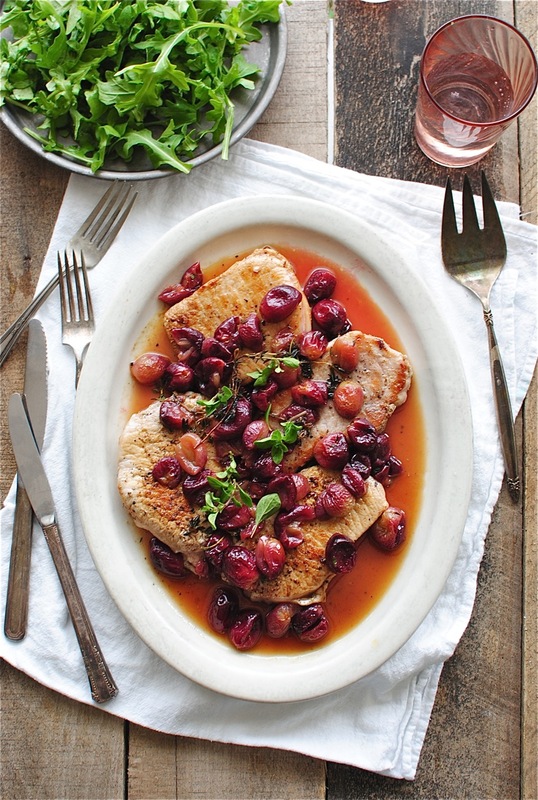 This dish looks amazing :) the roasted grapes look fabulous! Beautiful dish! Sweet grapes and savory pork sounds great together. Thanks for sharing! Enjoyed the recipe. However, I so wish that the Yummly site presented less prattle and more recipes. I just want to know what to buy and how to cook it - not the life story of the writer. There are calculators online that can do that, but I don't have that info. Sorry!